If you're anything like me you can't live a day without your planner. I don't understand how people remember all of the homework they have for each class! I would literally lose my mind! I have tried out a few different planners to see which one keeps me most organized. 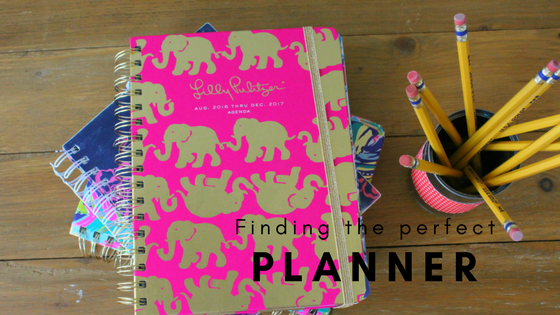 Ever since Lilly Pulitzer released their planners for this year everyone has been talking all things planners. Finding the perfect planner is something every organized girl is on the hunt for. Like seriously, when you find one, let me know! The struggle with planner hunting is whether or not to go with cute over functional, like come on, no one has planners as cute as Lilly! Today I am talking about the planners I have tried out over the years in search for the perfect one. Who knows, maybe one of these is perfect for you! I talked about this planner in a post last year and how I kept it organized so if you are interested in that click here. Freshman year of high school I was still really into Vera Bradley and I had everything VB for school. I tested out the Vera Bradley planner and was really satisfied! The VB planner has six lines for writing for Monday- Friday and three lines for writing under Saturday and Sunday. I think this planner is good for middle school or for someone who doesn't have a lot going on each day. I liked the lay out and it was perfect for freshman year but now that I have a lot more going on I need more space in my planner. Overall I think it's a good planner for people unlike me who don't write every single detail in their planner. Although I not a huge fan of the Vera Bradley prints any more, one thing I do like about their planners is that they have a few options for covers. Some of them are more professional looking and then there are some fun ones. They also give you the option of a 13 month planner or a 17 month planner which is nice because a lot of people feel like they waste months in the 17 month planner. I tried out a Lilly large planner over this past school year and I love it! The planner has eight lines for writing Monday- Sunday. I love the bright prints and patterns in the planner which make planning a little bit more fun. The planner is a good size that fits perfectly in my backpack. The cover is a paper/cardboard but it has held up really well over the past year. If you know me, you would know that I am a very busy person and this planner has the perfect amount of space for me to write down my busy schedule. The monthly calendars are a good size for writing down day-to-day plans but if you are one who likes to put stickers and cute little things like that on the monthly calendar this planner is probably not for you. One thing I like about this planner is that it comes with two pages of adorable Lilly stickers and it has Lilly 5x5 prints in the front. There are also twelve pages for you to plan out your next vacation, four pages for your addresses and phone numbers, and ten pages for taking notes. If you are someone who is always busy or writes as much as I do in your planner, this one's for you. The Lilly Pulitzer planner comes in four styles: large (which I use), jumbo, medium, and monthly planner. The Lilly planner comes in quite a few water color-style prints which will definitely add a pop of color to your school supplies. Those are a couple of planners I have tried out over the past couple of years.